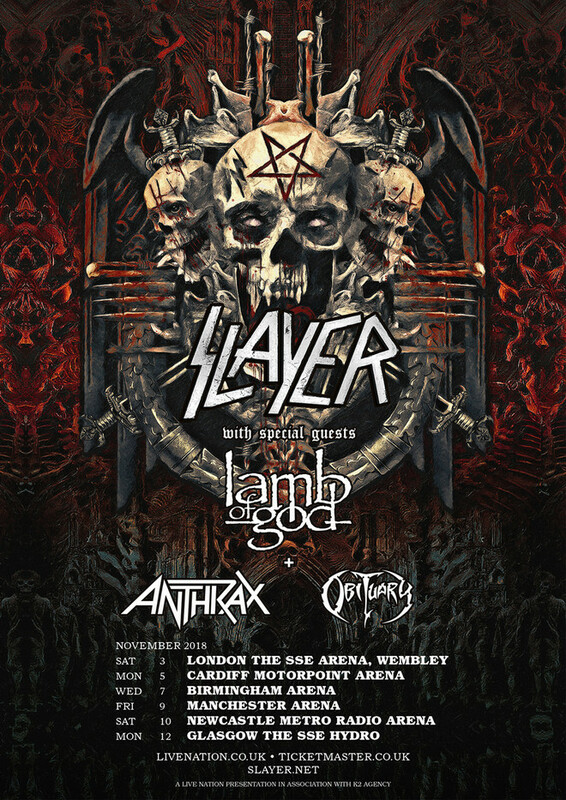 As expected after a couple of the Euro-dates slipped out earlier this week, here are the venues for Slayer’s final UK tour ever of all time (apparently). Disappointing that Glasgow will have to make do with the Hydro as it means the audio for the support acts will likely sound like it’s being piped through a tin-can-and-string telephone as usual. On the other hand: SSSSSSSSSSSLLLLLLLLLLLLLAYYYYYYYYYYYYYEEEEEERRRRR! Tickets go on general sale next Friday (18th May) at 9am. The band’s Slaytanic Wehrmacht fan club and O2 presales commence at 9.00am UK time on Wednesday 16th May and Live Nation’s pre-sales begins at 10.00am UK time Thursday 17th May. A very limited number of Slayer VIP packages will also be available over at www.slayer.net.